PARR/MARR: ALBERT ALIE ET GEORGIANA DUGUAY. PARR/MARR: JEAN-MARIE HOULDE & MARIE-ANNE BERGERON. PARR/MARR: PIERRE BERGERON & MARIE-JOSEPHTE BENOIT. PARR/MARR: GABRIEL DESCOTEAUX & MARIE-JOSEPHTE BERGERON. PARR/MARR: JOSEPH JANEL & MARGUERITE PROULX. PARR/MARR: JOSEPH MANSEAU & MARIE-LOUISE MARTIN. PARR/MARR: JOSEPH DESCOTEAUX & MARIE-JOSEPHTE BERGERON. PARR/MARR: JOSEPH BERGERON & JULIE GILBERT. PARR/MARR: JOSEPH BELANGER & JULIE HAREL (ARREIL). 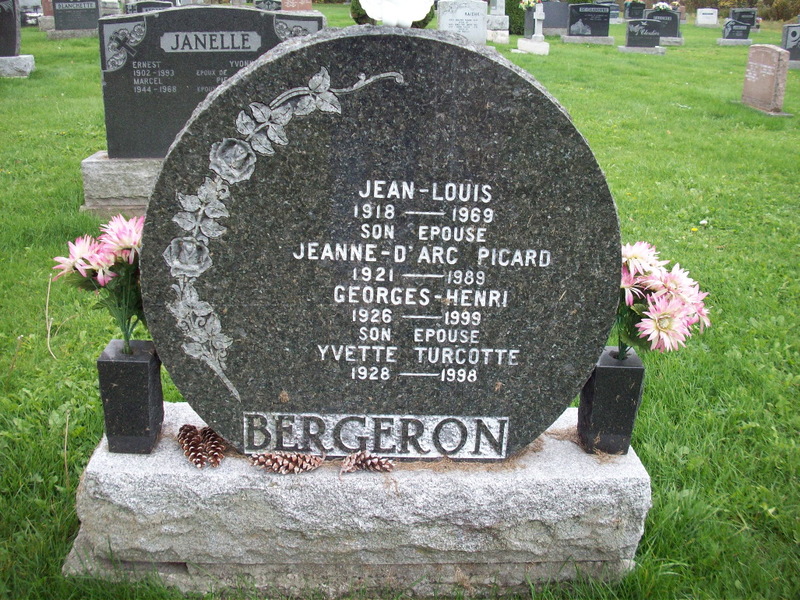 PARR/MARR: LOUIS BERGERON & MARGUERITE HAMEL. NOTE: À SON BAPTÊME LENFANT EST ÂGÉ DE 9 MOIS (PAS DE DATE). AGE 3 ANS; DÉCÉDÉ ACCIDENTELLEMENT. PARR/MARR: FRANCOIS JANEL & ELISABETH BERGERON. PARR/MARR: ANTOINE JOUTRAS & JUDITH BERGERON. PARR/MARR: ANTOINE BERGERON & LOUISE PROULX. Parr/Marr: LOUIS COTTEREST & MARIE-JOSEPHTE PRÉCOURT. PARR/MARR: J.-JEAN DESCOTEAUX & JOSEPHTE PRECOURT. OU LE 22 mai 1764???? PARR/MARR: JOSEPH PRECOURT & MARIE-JOSEPHTE AUBRY. PARR/MARR: CLÉOPHAS PROULX & SARA BENOIT. PARR/MARR: J.-J-B. BENOIT & LOUISE BELISLE. PARR/MARR: CHARLES DEROUIN & LOUISE ALLARD. AGE: 1 MOIS, 15 JOURS. PARR/MARR: OLIVIER MARCOTTE & OLIVINE MILETTE. PARR/MARR: LOUIS LEROUX & ADELAIDE DIONNE. PARR/MARR: JOSEPH LAFOND & MARIE-JEANNE BEAULORIER. OU LE 22 janvier 1768??? PARR/MARR: JEAN-BAPTISTE MANSEAU & ANGELIQUE COTE. ou le 10 juin 1837?